You are here: Home » News » New product release » How to choose an air fryer? If you are also addicted to the french fries or fried chicken but want them in a healthier way, you’ve come to the right place. Just because you want to improve your eating habits doesn’t mean you have to give up all of your favorite food! The love for all kinds of fried food is probably one of the reasons you are looking for an air fryer, but the air fryer can do so much more than just frying. Here, we will guide you on how to choose air fryers according to your needs. 1. What is an air fryer? Firstly, let’s look at what an air fryer is. An air fryer is a kitchen appliance that replaces oil with rapid circulated air to achieve the amazing effect of fried foods and taste. The best thing is that the air fryer can achieve the taste of delicious fried food with almost no oil. Instead, it filters out the fat from the meat itself to be used as oil to cook the meat, which is more tasty and allows you to consume way less fat. What’s more, the cooking process is also very simple and quick. So with an air fryer, you can enjoy all kinds of delicious food, including fried foods in a convenient and healthy way. 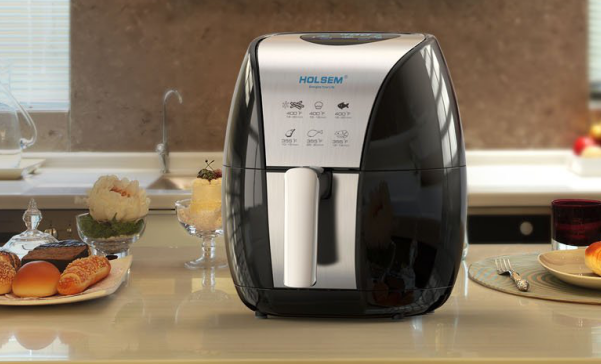 HOLSEM air fryer comes with built-in industry leading rapid air circulation technology to ensure the best cooking result and saves you the most time. 2. How to choose an air fryer? - Safety always comes first. Safety is always the top 1 consideration when buying all electronic appliances. When it comes to an air fryer, make sure to purchase the air fryer with ETL listed or UL listed (older style). Both ETL and UL are well-know and highest safety standards worldwide. Don’t consider any products without none of these safety certificate, which may put your safety into danger. 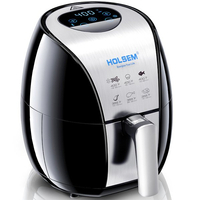 HOLSEM air fryer is ETL listed with guaranteed quality and premium material to ensure your safety. 3. How to choose an air fryer? - Manual or Digital depends on your needs and preference. A fancy LED display does make it very appealing and also very useful because it’s eye-catching and clear in displaying the temperature and time. But if you prefer to set up the time and temperature just by easily turning the knob, that’s also very convenient and fast to operate. So you can choose the manually operated air fryer or the digital air fryer with LED display according to your needs and preference. When choosing the air fryer, make sure to choose the one with removable drawer. An air fryer with a removable drawer is the only kind of air fryer that’s convenient to use, because the removable drawer makes it a lot easier to clean your air fryer after use. 5. How to choose an air fryer? - Customer Service and Warranty are very important. Like other kitchen appliances, purchase of any devices will be further value added thanks to its after-sale services and back-up warranty. The company with an easy-to-reach, responsible, and helpful customer service is a big plus for purchasing any kitchen appliances. Make sure when you choose any kitchen appliance, go to the brand’s official website to see if the customer service contact will be easy to find. At HOLSEM, your satisfaction is always our priority. Our friendly customer service team is here to listen and help to solve any issue that you may have. 6. How to choose an air fryer? - Air fryer accessories are a big bonus. The included air fryer accessories will help to expand your cooking options and allow you to make more varieties to your favorite food. Apart from the traditional fries, you can also grill chicken, steak, lamb and so much more using the accessories. Also, the accessories are made for the air fryer to be convenient and safe to use. 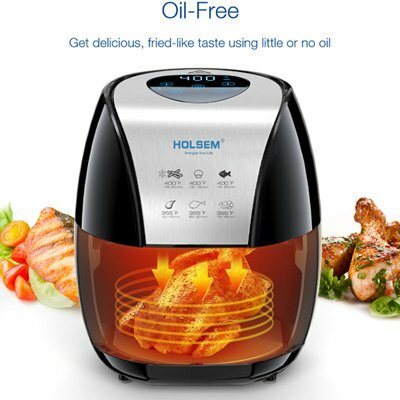 HOLSEM oil-less air fryer also comes with a free gift accessories kit, which includes a mini grill, six cupcake molds, a pot holder, a kitchen tong, and a recipe book for you to enjoy the various foods. 7. How to choose an air fryer? - Appearance does matter. 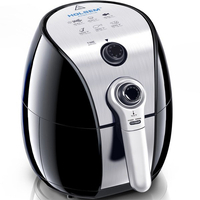 The air fryer will be placed on the kitchen counter or on the kitchen table and visible as a part of home decoration. So the appearance does matter. Choose the one that you like because if it works well, you will be seeing this kitchen appliance every day.